JACKSON, Miss. (AP) — A white Republican U.S. senator from Mississippi said during a debate with her African-American Democratic opponent Tuesday night that she apologizes to people who were offended when she complimented a supporter by saying she would attend a “public hanging” if the supporter invited her. Sen. Cindy Hyde-Smith’s remark was caught on video that was released last week. It has brought widespread criticism both inside and outside Mississippi, a state with a history of racially motivated lynchings. “For anyone that was offended by my comments, I certainly apologize. There was no ill will, no intent whatsoever in my statement,” Hyde-Smith said Tuesday during a televised debate with Democrat Mike Espy. The apology was a new approach for Hyde-Smith, who repeatedly refused to answer questions about the hanging comment at a news conference Nov. 12, the day after the publisher of a liberal-leaning news site posted the video on Facebook and Twitter. The clip shows Hyde-Smith praising a cattle rancher at a Nov. 2 campaign event in Tupelo by saying: “If he invited me to a public hanging, I’d be on the front row.” Shortly after the video’s release, she said in a statement that the expression was an “exaggerated expression of regard” and said it is “ridiculous” to read any negative connotation into it. Hyde-Smith is the first woman to represent Mississippi in Congress. Espy is a former congressman and U.S. agriculture secretary, is seeking to become the state’s first African-American senator since Reconstruction. “I don’t know how many Mississippians can really relate to an income that can command a $750,000 check from one person for a lobbying job,” said Hyde-Smith, who is a cattle rancher. Federal registration papers show Espy terminated the contract two weeks before its scheduled end. Hours before Tuesday’s debate, President Donald Trump defended Hyde-Smith’s “public hanging” remark, saying at the White House that she loves the people of Mississippi and the U.S.
Walmart asked Hyde-Smith to return a $2,000 campaign contribution because of the hanging remark. Walmart spokeswoman LeMia Jenkins said Tuesday that the company donated to Hyde-Smith Nov. 8, three days before the release of the video with the “public hanging” remark. Hyde-Smith’s campaign did not respond to questions from The Associated Press about whether it would refund Walmart’s contribution. Senate races rarely gain national attention in Mississippi, a deeply conservative state. But this matchup — the last major race of the 2018 midterms — has drawn scrutiny after Hyde-Smith’s remarks. Trump is traveling to Mississippi for two Hyde-Smith rallies Monday on the eve of the election. Former Vice President Joe Biden has endorsed Espy. Hyde-Smith was appointed to the Senate to temporarily succeed longtime Sen. Thad Cochran, who retired in April amid health concerns. She is the first woman to represent Mississippi in Congress. 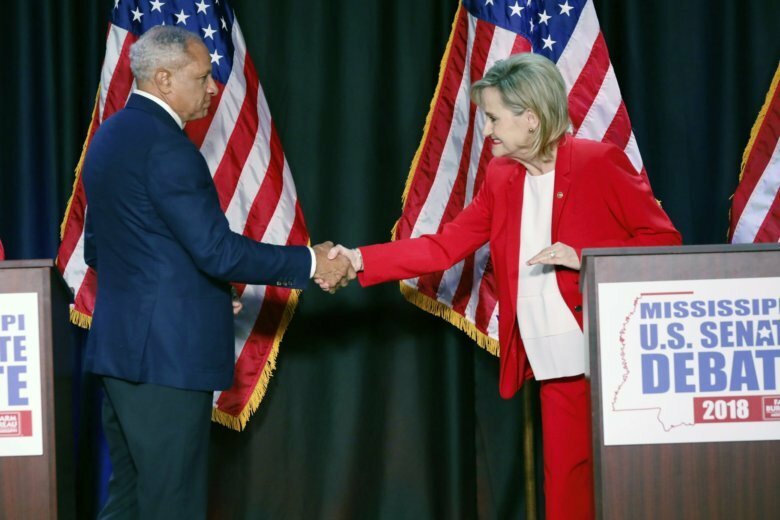 Hyde-Smith and Espy each received about 41 percent of the vote when four candidates were on the ballot Nov. 6. If she wins the Nov. 27 runoff, Hyde-Smith would give Republicans a 53-47 majority in the Senate. Associated Press writer Zeke Miller contributed from Washington. For AP’s complete coverage of the U.S. midterm elections: http://apne.ws/APPolitics . Follow Emily Wagster Pettus on Twitter: http://twitter.com/EWagsterPettus .